Get fuel straight to your Muscle! 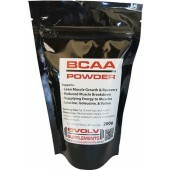 Branched Chain Amino Acids are made up of the 3 Essential Amino Acids: Isoleucine, Leucine, and valine. These are of special importance for athletes because they are metabolized in the muscle, rather than in the liver. Taken before and after training they help by:Providing Fuel to your muscles, Increased Protein Systhesis & Faster Recovery with other possible benefits of weight loss, increased performace and reducing muscle breakdown.